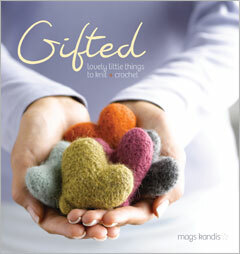 Gifted, Lovely Little Things To Knit & Crochet is the name of one of the most recent publications from Interweave Press. Doesn’t it have an inviting cover? Mags Kandis has created a very attractive array of knit and crochet items that will make wonderful gifts for those special people in your life. The book is divided into two sections, “Gifts for the Body” and “Gifts for the Soul”. The projects are ALL beautiful and charmingly photographed. However, there are only seven crochet patterns! That said, there is plenty of inspiration in this book even if it’s in the form of knitted projects. In addition to the knitted and crocheted gifts, there are several items that are crafted from or embellished with pre-made woolens that are felted. That sort of recycling is something I appreciate. I especially like the bangles that are wrapped and felted. There are even a couple recipes to include with your handcrafted gift to make it even more special. If you are one who both knits and crochets, this could be a great addition to your library. I am currently knitting an afghan and plan to crochet around the edges of it to give it a nice finished appearance. I would love this book. I’m always looking for great ideas. My next crochet project will be an afghan to match the colors in my sisters newly painted living room. My next project is a beautiful throw (Temair – free on line pattern from Lion Brand Yarn)- challenging, and therapeutic. Nothing like a good crochet/knitting project to relax the mind…. I am working on a lapghan for someone for Christmas then I will make a baby blanket for my brother’s baby to come. Working on baby sweater sets and afghans for a craft show and for gifts. Also make things for a crisis pregnancy center in our area. Waiting for my disability to be approved, so right now money is tight and all my Christmas presents will be crocheted or knitted. Would love to have this book so I can make new things! My next crochet project hopefully will be a sweater for my husband for Christmas! Cool book! Your giveaway on September 7 doesn’t allow comments! Too bad, because someone would love to get this book! What a beautiful looking book! Will be adding this one to my wish list! I both knit and crochet and have been eyeballing this book! Love your site and your work, very generous of you to offer free patterns and great links. I crochet and knit. Just finished a crochet hat with a knitted scarf for a friend. I am working on a sweater right now. My next project is pretty pink scarf for my little cousin’s 10th birthday! Love Mags’ work and would love this book! As for my next crochet project… baby booties! This book looks amazing. I’m always looking for new things to work on. Currently I’m working on a wrap for me, a blanket for the heck of it and some little animals for halloween decorations. I would love this book. I’ve been a benginner in tatting and just started getting into crochet and was just shown how to knit. This would make a great addition to my crafting library. Thanks for the opportunity to win! Lots of very interesting ideas. I enjoy crochet and knitting. I am working on an afghan with the Saints logo on it for a grandson. Next will be another afghan for another grandson (logo of his choice).